Showing 36 articles from April 4, 2018. LOUISBURG -- The Franklin County Board of Commissioners unanimously approved a grant-funded jail position that will help law enforcement battle the rise of inmates who suffer from mental illness and substance abuse. Stepping Up is a national initiative to keep the mentally ill out of jails and nearly two years ago, Franklin County commissioners agreed to redirect $20,000 in mental health funds toward the program. FRANKLINTON -- The town's Martin Luther King Jr. Committee, along with town staff, will host a road dedication ceremony on Friday. The unveiling of Dr. Martin Luther King Jr. Boulevard will represent the erection of the first and only marker dedicated to the life and death of the slain civil rights leader in Franklin County. 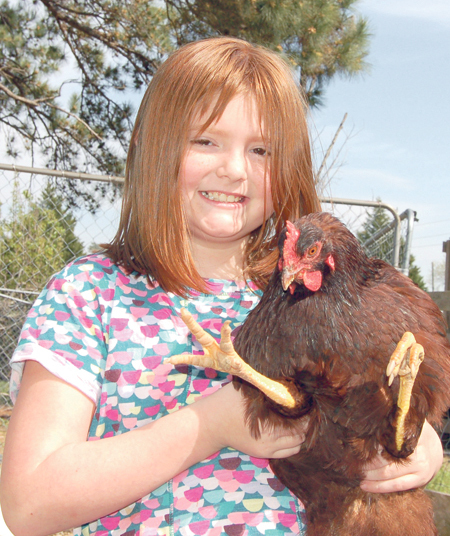 It's not a spring chicken, but Destiny Adams holds on to one of the chickens she raises, with help from her family. Adams, like many children in a few weeks, will demonstrate animals as part of the Franklin County 4-H Livestock Show at DD Equestrian Center on April 27. The long awaited new athletic complex at Louisburg High School received a green light from the Louisburg Board of Adjustment late last week, apparently clearing the way for the project to go out for bids later this spring. The proposed complex is planned on a 53.21 acre tract west of the Allen Lane and Wilder Street intersection. LOUISBURG -- The setting: A muted, but still bustling Tar Banks Brewing Company. The scene: Filmmakers and cinephiles gathered in a dimly lit space, waiting for flickers of light, in tandem with sound, to dance across the big screen. 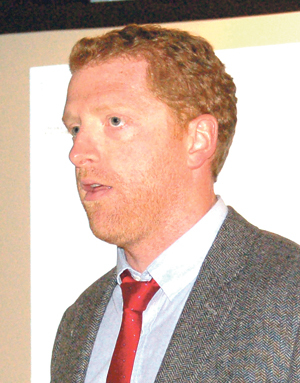 The script: Louisburg Town Manager Jonathan Franklin said Franklin Flicks, the Franklin County International Film Festival, was a key cog in the town's efforts to revitalize and rejuvenate activity in town. The most reliable sign of spring may be yellow! 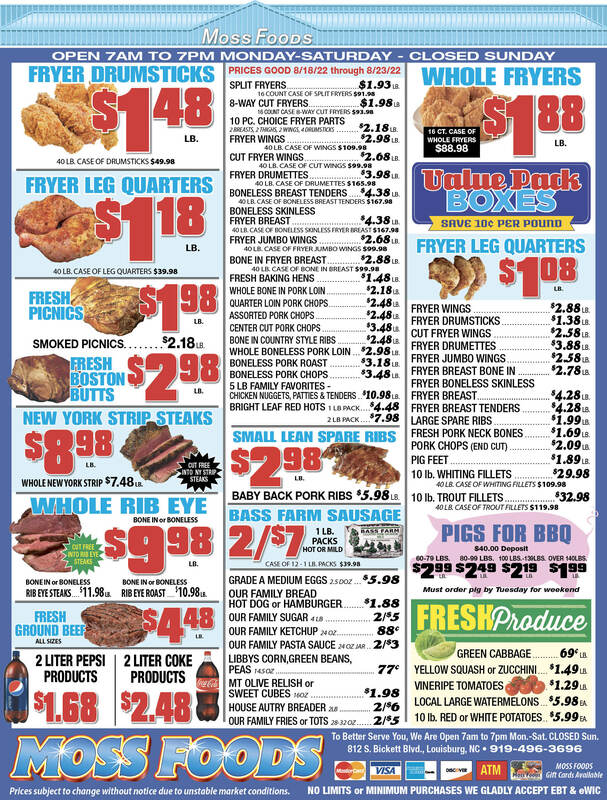 It's officially spring! And it has little to do with the calendar and maybe even less to do with the temperature. Nope, we all know that spring has arrived because the pollen is rapidly reaching cloud-like levels. That became apparent early Monday morning when I jumped into my car -- which was parked outside -- and realized I could barely see through the windshield in the pre-dawn light. In this day and overly political age, it may be difficult to believe, but there has been a good idea floated in the Congress -- yes, THAT Congress -- and it might even have a positive effect on rural areas of the United States like good old Franklin County! But what's even more difficult to believe is that the idea was first floated by Senate Majority Leader Mitch McConnell, the Kentucky Republican who has been on the wrong side of about every issue that's important to rural America. Ethan Couch and his mother, Tonya, are like two ships passing in the night. That is, if the ship was the S.S. Minnow, their last name was Howell and, instead of Gilligan's Island, their destination was jail. If you don't remember the names, right away, you may very well remember this term: "affluenza." I am no longer a resident of Franklin County and don't really have a dog in the fight over the removal of the Confederate Monument that has stirred local debate. 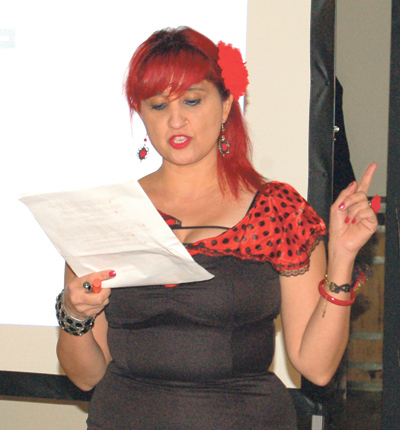 But what I do have a dog in the fight with is free speech and citizens' rights to express it during "public forum" sections of county commission and town council meetings. Drug overdose is now the leading cause of accidental death in the United States. In 2014, it surpassed both car accidents and gun violence in number of deaths. Those with loved ones who are using opiates or heroin need to be aware that opiates are the main contributors to this problem. NASHVILLE--Funeral services for John H. Moore, 86, who died Tuesday, March 27, 2018, will be held Saturday, April 7, at 12 noon in the Richardson Funeral Home Chapel in Louisburg. Burial will follow in the Pleasant Grove Church cemetery. 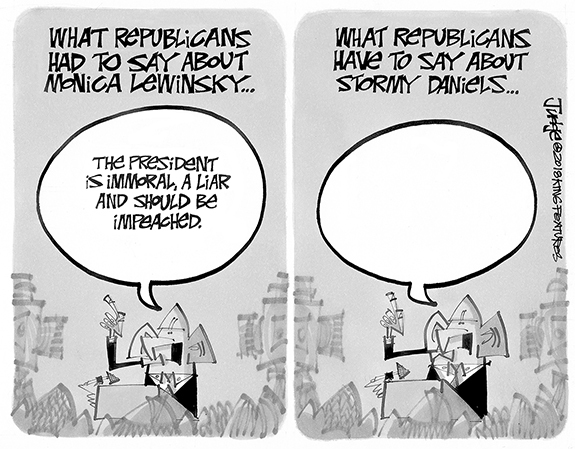 DAVIE DOES IT AGAIN. Leadoff master Davie Morgan rounds third and heads for home for the Bunn Wildcats during Tuesday's championship decision over Wake Forest High School. 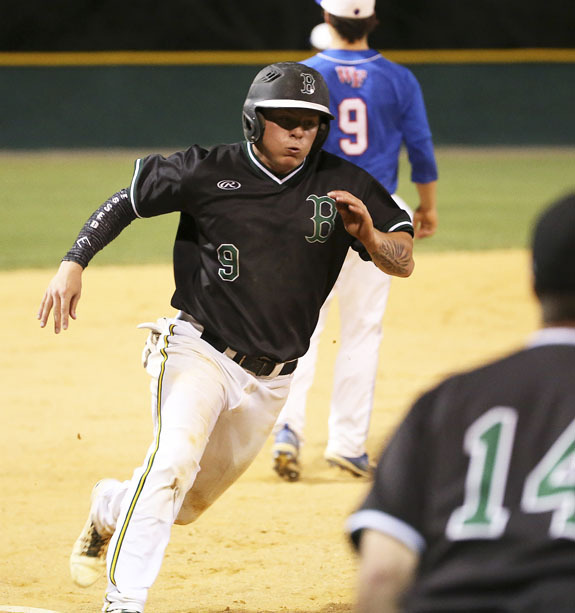 FOUR OAKS - Bunn High School baseball and the Johnston County Easter Invitational Tournament -- few entities have gone together as well over the past handful of campaigns. Despite facing higher-classification schools in just about every game, the Wildcats have built a niche at the annual event at South Johnston High School's Bruce Coats Field. 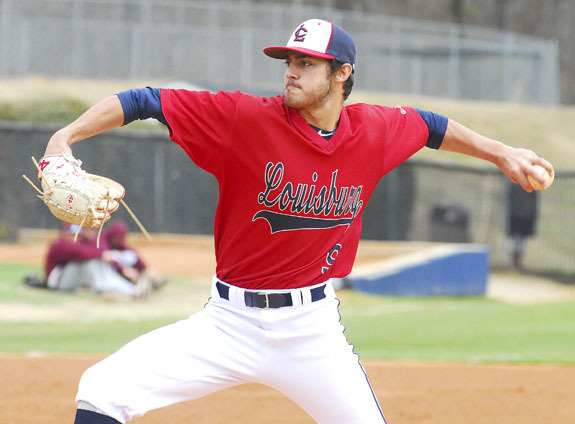 LOUISBURG -- When Louisburg College baseball coach Blake Herring analyzes his sport, he surmises that three intangibles are the biggest contributors to success -- offense, pitching and overall team defense. 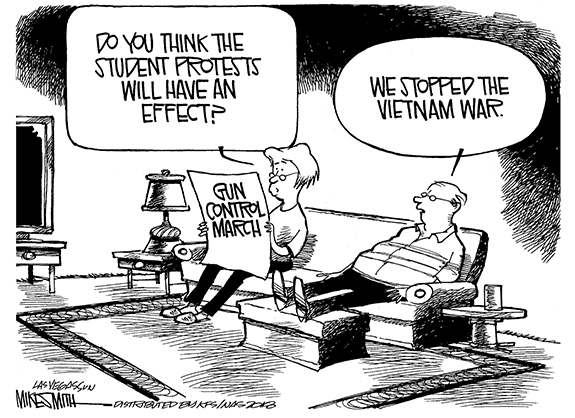 If at least two of those factors are in play at the same time, victories will soon follow. 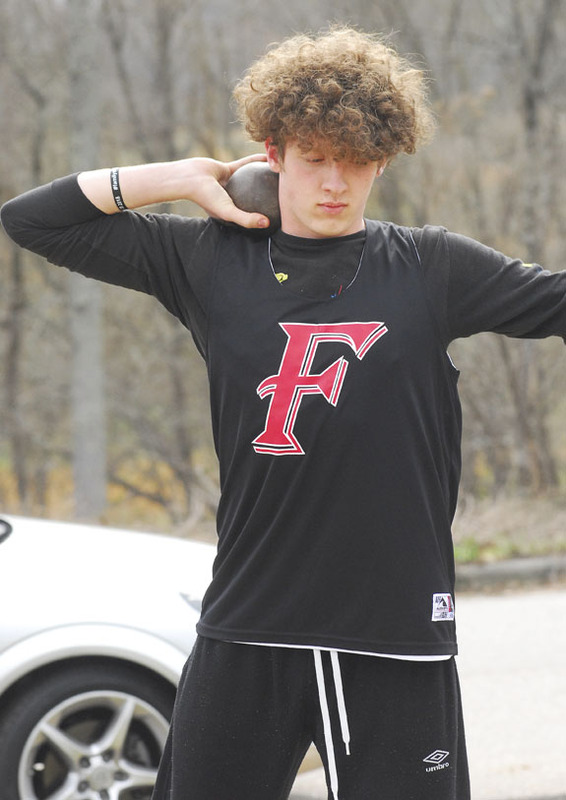 FRANKLINTON -- Northern Nash's boys track and field team and the Franklinton High School Football Field seem to be forming a perfect union this spring. Two weeks earlier, Northern's boys had taken first place at the annual T Sanders Invitational Meet on the FHS campus. The Fighting Knights made a return trip to Franklin County last Wednesday and were the winners of a Big East Conference tri-meet that also featured Southern Nash and host Franklinton. 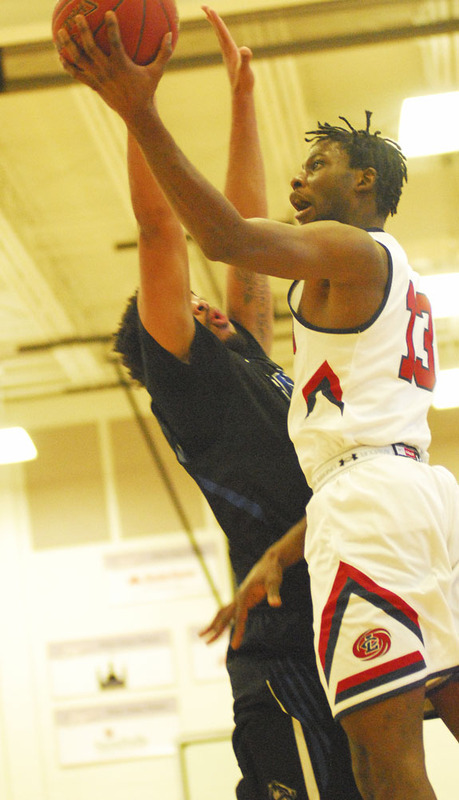 LOUISBURG -- Long-term success breeds an increased level of expectation -- and that is something the Louisburg College men's basketball program is now experiencing on an annual basis. The Hurricanes have become a consistent winner -- so much so that anything less than a deep run in the National Junior College Athletic Association Division II National Tournament is considered somewhat of a disappointment. 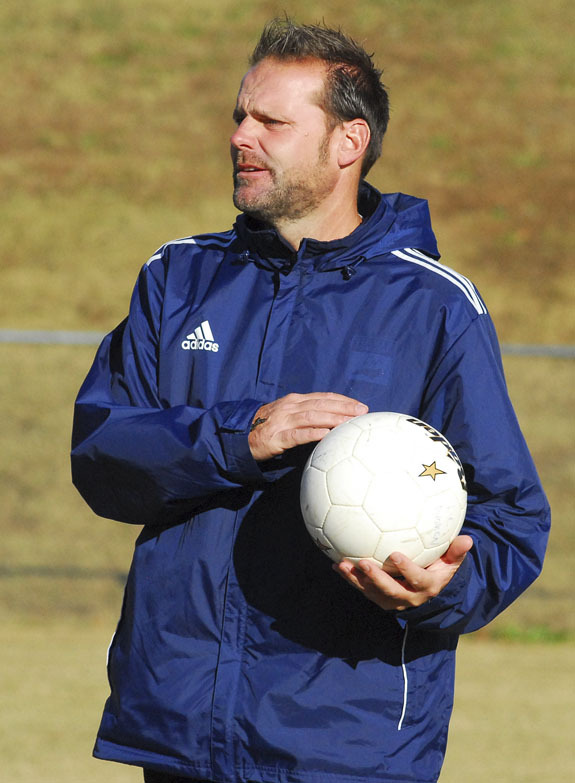 LOUISBURG -- When Andy Stokes arrived at Louisburg College as the new women's soccer coach in 2009, he didn't envision the fact that he would spend the next decade on the job. But that's the way things played out as Stokes made the daily commute from his home in Raleigh to oversee a program that would go 89-42-5 during his tenure. LOUISBURG -- Due to the threat of poor weather, Louisburg High School's appearance at the North Johnston Softball Tournament has been pushed back by one day. The event was supposed to be held Wednesday and today, but will now be staged today only with four games scheduled. 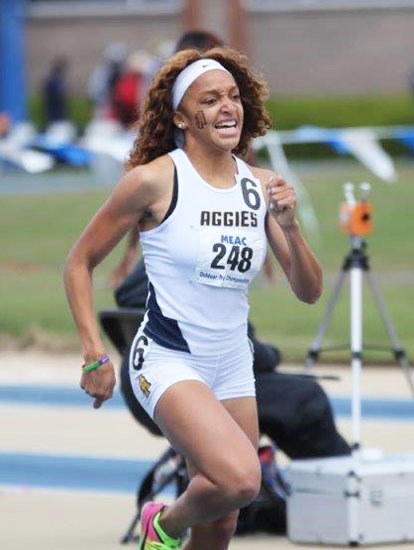 GAINESVILLE, FLA. -- The North Carolina A&T men's and women's track and field teams traveled south for a holiday weekend and tallied a plethora of personal records at the prestigious 74th annual Pepsi Florida Relays hosted by the University of Florida at James G. Pressley Stadium. The women posted 11 top-10 finishes, eight personal records, seven season-best marks and a new school record while the men had eight top-10 finishes, two personal records and two season-best marks. FRANKLIN COUNTY -- A football signed by former Bunn High School star Tarik Cohen will be given away as part of the Franklin County Relay For Life event on April 27. Cohen, now a running back for the Chicago Bears of the National Football League, personally autographed the ball in support of Relay For Life. A drawing will be held as part of Relay For Life. Tickets are $5 each and can be purchased by calling (919) 496-1480. ZEBULON -- The Carolina Mudcats, the Class-A Advanced affiliate of the Milwaukee Brewers, unveiled their initial roster for the 2018 season on Tuesday. The Mudcats will open the new season with Milwaukee's top overall rated prospect Keston Hiura, former first round picks Nathan Kirby and Clint Coulter and 10 players returning from the 2017 team. 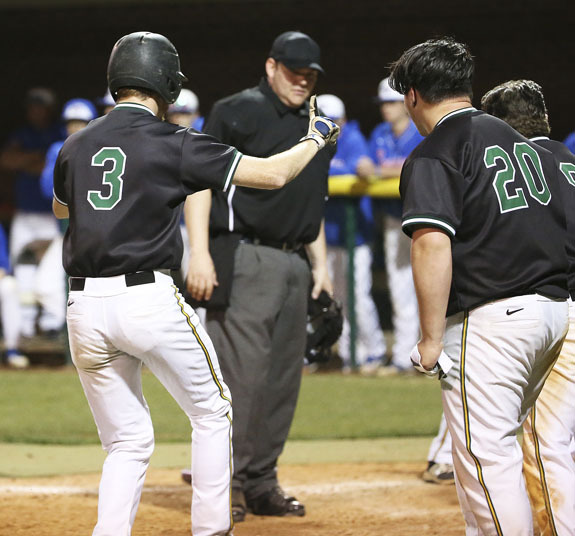 Bunn's Andrew Smith (left) is greeted at home plate after hitting the eventual game-winning home run during Tuesday's finale of the Johnston County Invitational Easter Tournament. 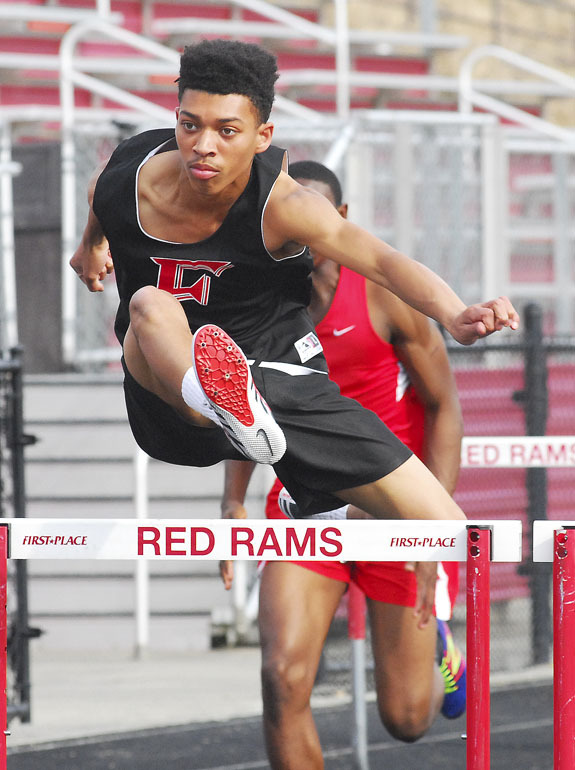 Franklinton's Nehemiah Judkins secured a convincing victory in the Boys Sprint Hurdles during last Wednesday afternoon's Big East Conference Track and Field Meet. 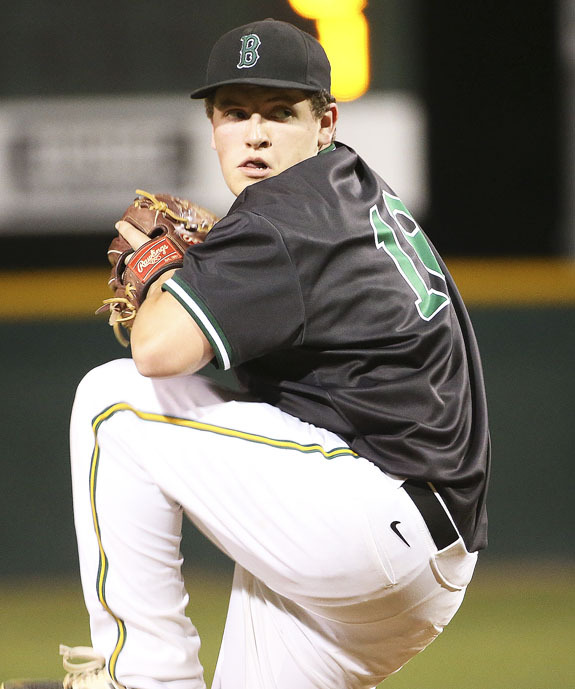 Tripp Harris was the starting pitcher Tuesday for the Bunn Wildcats during the title game of the Johnston County Easter Invitational Baseball Tournament at South Johnston. Franklin County Schools are losing at least two veteran principals at the end of this school year. Both Dr. Laverne Daniels, principal of Bunn High School, and Dr. Danielle Jones, principal of Bunn Middle School, will be leaving after they finish their obligations to Franklin County Schools at the end of this academic year. Kerr Vance Academy in Henderson recently announced its latest honor roll and headmaster list. 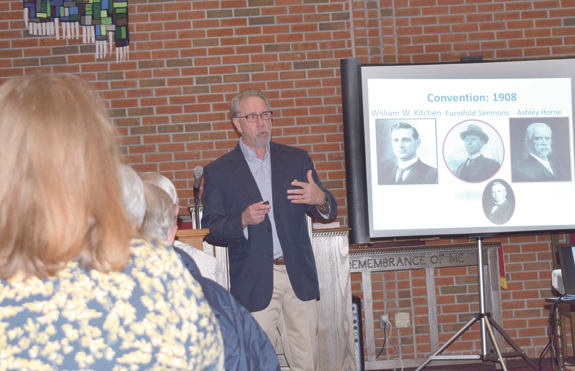 Dr. Karl E. Campbell noted that Bickett said in his inaugural address that he was "committed to raising people up" and created a progressive legacy by restructuring taxes, supporting public schools, limiting child labor, building good roads and improving medical care. 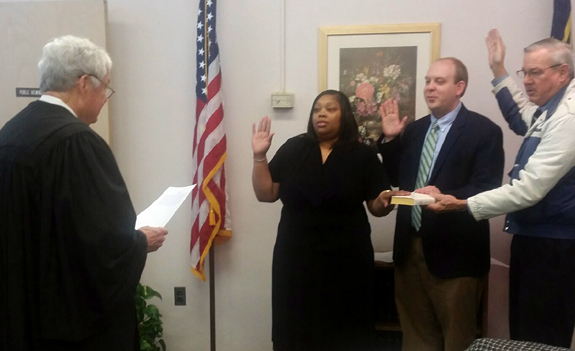 Superior Court Judge Robert Hobgood swears in three new members of the Franklin County Board of Elections. From left are Sonravea Privette and Andrew Beal, the Democratic representatives on the board, and Harry Barrick, the Republican representative. The State's Board of Elections, with input from the local Republican party, is set to appoint one more Republican representative to fill out the four-person board. BUNN -- Commissioners declined to make a zoning change that would have allowed another downtown business. Percell Davis petitioned commissioners to amend its zoning ordinance to allow truck repair in the downtown commercial zoning district. Davis proposed to operate such a service at 108 Warren Avenue. The property is zoned commercial, however, a house sits on the property now. LOUISBURG -- The Franklin County Board of Commissioners dealt with two items that had some type of delayed gratification attached to them. First, the board adopted a resolution in support of a $350,000 State Department of Transportation grant that K-Flex will use to improve a road that leads to its newly expanded North American headquarters in Youngsville. There is no county match required. LAKE ROYALE -- The Lake Royale Property Owners Association recognized four teens who earned national recognition for their patriotic essays. 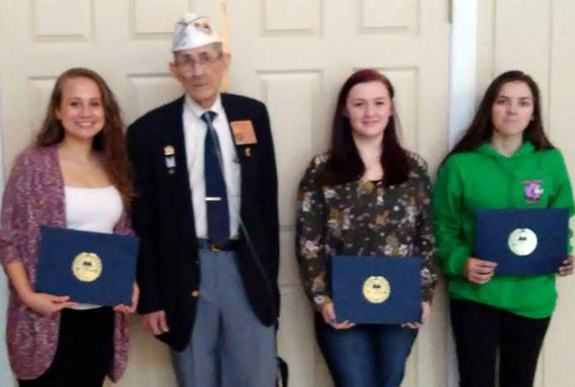 Charlie Floyd, Mia Floyd, Kasey Clift, Carlie Clift, Regan Schmidt, Kayln McComas and Taylor Jones received top-level honors in the AMVETS Americanism Program -- a patriotic program the organization offers schools and youth organizations as a resource for teaching children in kindergarten through 12th grade about their American heritage, civics and citizenship. 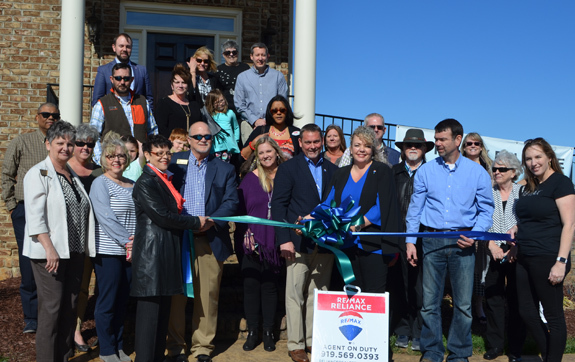 RE/MAX Reliance in Youngsville recently held a ribbon cutting and grand opening at their office, 20 Gatekeeper Drive, off US Hwy. 1. The Greater Franklin County Chamber of Commerce was on hand, as well as many business and community leaders. Pictured behind sign with the ribbon is the broker/owner, Kimberly McKinney and to her right, RE/MAX Reliance agent Mike Rowe.